At what age does amperage become appropriate? used for the reinforcement of positive behavior. So I lean towards the introduction of the E-collar around the same time. Do you have an opinion? We decided to go with your choice of E-collar. And understandably so after a small amount of research we knew you were leading us to a quality product. Now when would you begin using the E-collar in a puppies training regiment. Do you mind letting us know? Stay away from e-collars for many, many months … the physical toll on a pup’s neck is a good reason . Also, I agree training starts the day you bring pup home … whether you know it or not, formal or otherwise. That’s a good thing. But no puppy will have a clear understanding of commands at a young age, thus can’t be corrected with an e-collar. The idea of the collar is to reinforce commands a dog already understands well. The better puppy training tools in my humble opinion, are: praise in all its forms dispensed liberally, reasonable expectations about what a very young animal can learn and how fast, an enclosed yard, leash and check cord, and judicious use of repetition. Most professionals would probably recommend NO e-collar for many months if not longer! Never give a command you can’t enforce. Never give your dog an opportunity to do things the wrong way. Don’t set up your dog for failure. How about you readers? Comments? Random question.. but do you have a favorite (or any) Chukar recipe? I have about 7 breasts to clean (I assume you take ribs out) and cook.. any ideas? Or do you know of a good site to find one? Simple. Easy. Marinate in balsamic vinegar salad dressing. Cook hot and fast to rare on the grill, they will continue to cook after you take them off the grill. Serve over brown rice with a good white wine. Salud! I shall try and keep this as short as possible. I will share how I went about introducing the e-collar to my own dog. She was older than 6 months.. I want to say she was more like 8 or 9. I was driven to the decision after attending an AKC hunt test where she decided to totally blow off my commands. Let me step back a bit and tell you about her early stages. As a puppy she grew up on quite a bit of property, even so, there was no fence so she at a very young age was kept on a light check cord of probably 30 or more feet. I used this so I could reinforce commands and teach boundaries etc. So from a young age there was an open line of communication concerning what I wanted of her, and it was aided by use of the rope. I feel very strongly that there should be no idle commands, this meaning if you tell your pup to do something they need to do it, and you need to be able to back up what you say, or you are better off not saying it. This is where the e-collar came in. The hunt test is such a stimulating and exciting environment that it tested the relationship we had formed already, and she “knew” she was off the lead and I would have no way to back up what i said (but I was not allowed to physically touch her in these tests, but still needed her to mind). In my opinion what she did that day graduated her to the use of an e-collar. which after having the proper connection and relationship with your dog should be seen as the next phase in building your relationship off leash. When I put the collar on, she first wore it without me doing anything, in hopes of her not associated the stimulation with the actual collar. I also had her dragging her rope as usual. The first command I used with the collar was “come” this is a command I knew she already knew, I simply backed it up with the collar if she was not complying. Having the rope on allowed me to control her initial reaction to the collar, and sort of guide her to what I wanted if need be. She took to it well, but I feel she was mentally ready for it as I had already prepared her with simple rope work and a solid training relationship from an early age. To this day I can use very little stimulation to simply “talk to her with the collar” so it’s not a form of correction, but instead is communication. If you continue to use it more as communication in a positive sense rather than only for correction, you will get a dog that is less likely to become what we call “collar wise” where they only behave when the collar is on and not overall out of respect for you. I think you do have to keep in mind the puppies size when putting a rather heavy collar on a puppy.. and really do you need to go to electronic means when early work can very easily be done on a light rope (by means of a very light encouraging tug), with the same end results. In the hands of a skilled and experienced owner/trainer it may be ok to introduce young, but let’s face it, a majority of people are not very experienced when it comes to puppies. I mean I am not. So part of the reason I waited was also because I wanted to make sure I knew what I was doing and that the puppy would be old enough to handle some of my mistakes if and when I made them, as we are all bound to mess up sometimes with our puppies. Every person and dog is different, but in the end, I feel a rope/lead is a very important tool in establishing leadership, commands, and boundaries with a puppy, or any dog really. You have to have that point of contact, and communication before you should introduce anything invisible like electricity. Thanks Anna. 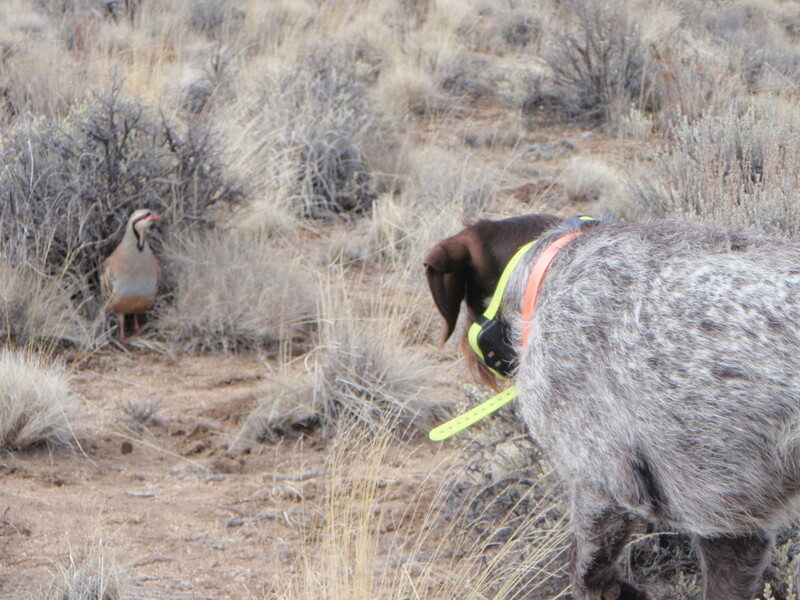 I think some of the bird dog trainers call what you’ve described as “chaining” commands and reinforcement methods. I really enjoy your site, keep it up. I live in Utah; do you have a syndicated program I can pick up here? I watch your program, Wingshooting USA, as often as I can catch it. I have also enjoyed some of your other programs. You are an asset to dog and hunter. An e-collar used correctly, in a positive manner, can be one of the most effective tools a dog trainer has. Please note, I still believe the most effective tool we have is the emotional bond “built”, through time, effort, interaction, and training, with our dogs. However this said I start putting the e collar on puppies as young as 5 weeks of age for only very short times, 5 minutes usually. I use the “pulse” or vibrate button (EXCULSIVELY, NEVER do I stimulate a puppy of this age) to reinforce “come” at this early age, specifically while developing the love and desire to retrieve. Please let me explain what I do with a puppy of perhaps 5 weeks that has never had on a collar. I have already thrown a glove for two or three sessions for retrieving, and the pup is somewhat familiar with this exercise. It sees the glove thrown will usually go 2 or 3 feet to the fall, pick up the glove and play with it, slowly bringing it back. This usually becomes slower and slower on the next couple of attempts, again note, at this early age I only do this about 3 times per session and I have several sessions per day because this is very positive interaction with my pupil. I set this up in a small area in my back yard where there are no distractions, in an area that is very contained, it is like a hallway with fences on both sides. After a retrieve or two the most puppies then begin to think this is play time and start to run an play with the glove, I then push and hold the “vibrate” button while calling come and beeping the come command on the whistle. The puppy may drop the glove and look around, but usually the vibrate is very comfortable they look around, the vibrate is so non-intrusive it just brakes there concentration, and puts them back on task. As soon as they start back to me I let the button off. I have used this process on “many” puppies, but again NEVER do I use stimulation on a puppy this age. As a note, this process used in a positive manner is such a great and humane process. I personally have dogs that are mature hunting partners and have only felt very slight pressure 2 or 3 times in their entire life. Countless books and videos have been made on e-collar use, and their benefits, I agree 100% they can be fantastic, even on young dogs. There are some great learning tools available, check out Jim Dobbs on the web, anything Jim suggest is Gospel. However, if you don’t want to take to time use the collar effectively do not use this process. I have seen MANY dogs “ruined” by one simple push of the button, or one session where a trainer lost his temper and his “partner” never recovered mentally, NEVER. Good luck, may the dogs keep hunting, birds fly strong, shots be true, and may we always have the smell of a new puppy! Thanks Gary. Vibration – good. Stimulation – good later. Ask your local news-talk or sports-talk radio station to carry my show! Not on in many Utah markets, and every phone call helps.